Cricket bosses in Australia welcomed the splashing of huge dollars by private investors, including Indian billionaires, in the IPL-style Big Bash League, starting in 2012, even as Cricket Australia chief predicted the BBL to rival Kerry Packer's World Series in the impact it will bring to the game. State cricket chiefs are delighted to the idea of private investors pumping huge sums of money to their sides. CA is a bit cautious in its approach though it is desperate to cash in on the Twenty20 gold rush with the advent of the Indian Premier League. A top official of New South Wales, one of the most powerful state cricket bodies in Australia, said CA is under massive pressure to accept private investors. "The door to private investment was opened four years ago via the IPL and this has seen an influx of funds into the Board of Control for Cricket in India's (BCCI) coffers whilst other countries simply provide their players and support this revenue growth in the process," the official said. "While India has thrived, CA's revenues have taken a hit given the GFC, the strength of the Australian dollar, with less tourists coming, and declining gates. Cricket needs an injection of capital that will allow it to compete for the younger audience and women the game desperately needs," he was quoted as saying by the Daily Telegraph. Cricket Australia board members will decide whether to accept private equity from Indian and other overseas investors as part of the ownership structure for each franchise. Queensland chief executive Graham Dixon said the CA board, which is to decide on the issue, needed to give a clear directive to take the game forward. "The indications which have been given is that there is a very strong financial argument why we must move forward, so that should be good," Dixon said. "I don't know we need a lot of detail. We just need to agree to the concept. Is there or is there not private investment? Then you go away to work out how you want that to work or not work." 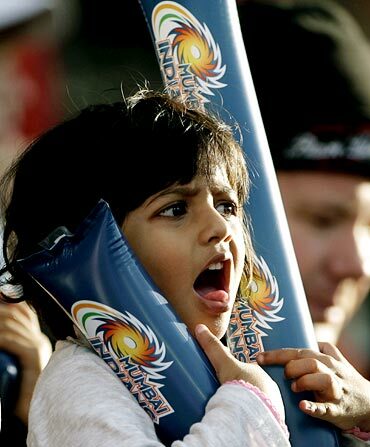 Media reports said Australia's most powerful cricket states NSW and Victoria will have Indian part-owners as they have already sold shares to giant Indian corporations for around US $60 million in return for profits from the IPL-type eight-team Twenty20 tournament starting in January 2012. The Daily Telegraph said Brisbane-based Adani Group, which lost an IPL bid, is interested in buying stake in an Australian side for the BBL. Gautam Adani, the 10th-richest man in India with estimated personal wealth of US $10 billion, is even looking at investing in Queensland coal mines and even buying the port of Brisbane, the newspaper said. It quoted an Australian businessman of Indian origin as saying that the sort of money the cricket teams were talking about -- between US $5 million and US $30m is "very cheap" for these billionaires. The newspaper said NSW Cricket has set up a separate business entity, known as Blues Inc, to run the state's Twenty20 franchises, and Indian investors want a 49 per cent share of the company and have all but signed off on a figure of US $30 million. The Australian claimed that NSW had discussions with Jay Mehta, the billionaire co-owner of IPL side Kolkata Knight Riders, about investing in the state's cricket. It said that both NSW and Victoria have different four-man consortia from India willing to pay millions of dollars to take a minority share-holding in the new Sydney and Melbourne teams. "One of them has US $5 million ready to go now with more to come," the newspaper said, quoting an unnamed official. Cricket Australia Chief executive James Sutherland described the setting up of the BBL as "the most significant development since World Series Cricket" and is fully aware state bodies have threatened to establish a breakaway competition if the overseas investors are turned away. "If we get BBL right, it will have a significant role to play in cricket continuing to be a major Australian sport," Sutherland said. "It's a moment as big, if not bigger, than the Kerry Packer moment when his role resulted in ODI cricket taking off and basically funding the development of Australian and world cricket for 25 or so years," CA spokesman Peter Young said. CA bosses were shown projections that BBL could generate as much money as international cricket and franchisees could be worth US $80 million each in a few seasons, four times their initial value of US $20 million each. Desperate to cash in on the Twenty20 gold rush with the advent of the IPL, CA has brought forward its plans by a year to begin a new city-based competition in 12 months. The current six state sides will expand into eight city franchises. The eight teams will play each other twice before a finals series in a tournament over five weeks. NSW and Victoria will have two teams and four other states one each. The franchises will have a salary cap of US $2.6 million. Television coverage is likely to be shared between Channel Nine and Fox Sports but CA's deal with Nine expires in 2012 and interest from other commercial networks is expected. Within three years the CA is expected to open a window in January free of international cricket to allow all of Australia's current and retired stars to play in the BBL. Two high-profile overseas players will be allowed in each of the eight teams in a tournament that will replace the traditional one-day cricket over January and February. State associations are expected to remain in charge of all existing teams regardless of ownership structure. Reports, however, said there was a divide between the states with some characterised as wanting to take any money on offer and run, while others are a little more conservative about the approach and concerned about the share of equity. CA also fears that teams will be worth far more once the competition starts and so any investment now may largely undersell the value of the new franchises. Already there are concerns about tax and money leaving the game. CA is a non-profit organisation, as are the states, and all income goes back into cricket. However, private ownership will mean funds are lost to taxation and investors. CA has conducted enormous research but has been accused by some state officials of "dragging the chain" while others fear that enormous sums of cash pumped into some teams by private owners may result in a lop-sided competition.